How to Choose the Right Gaming Monitor? Home Buyer's Guide Other Products How to Choose the Right Gaming Monitor? Building a gaming rig can be tricky. You have to select the best components from out there that suit your gaming style and give you the best value for your money. Your hardware can not only give an edge over your competitors but will give you the most immersive real-life experience from your place. Gaming monitors like traditional monitors come in a variety of size and technical details. To choose the best you need to look for parameters like size, resolution, panel type, aspect ratio, viewing angle and more technical details like response time and refresh rate. 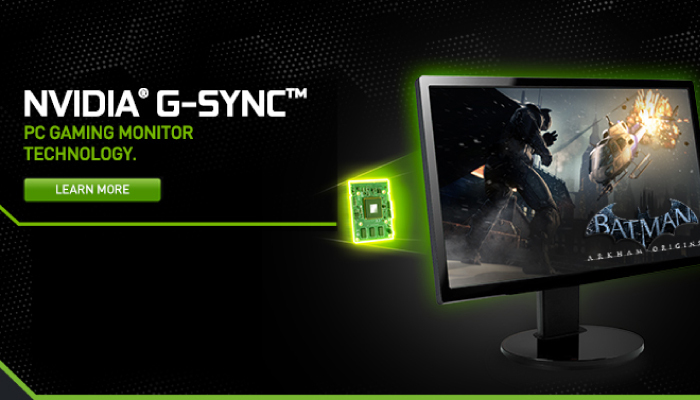 You also have to choose your monitor according to your graphics card type (NVIDIA, AMD) because of its synchronization technology (G-Sync, FreeSync) it supports. In this guide, we will break down the parameters you need to watch out for while purchasing your gaming monitor for your rig. Screen Size will be the first thing that you notice in a monitor and bigger is almost always better. Gaming monitors usually come between 21 inches and 27 inches creating a balance between visual clarity and comfort level. Anything above 27 inches will not make much of a difference as you will be viewing them up-close. Screen Size also depends on other parameters like resolution. The larger the screen size the higher should be the resolution. If you want a 1080p gaming monitor, better not get larger than 24 inches since the result could lead to a decrease in quality. Resolution determines the clarity and the visual details of the contents. Higher resolution will also demand more processing power and a powerful graphics card. Furthermore, the resolution of the monitor will determine the FPS (Frame-per-second). Mid-range monitors are mostly QHD/2K that are able to maintain a 30FPS in that resolution. For the top UHD/4K, only the top-level graphics card will be sufficient to give over 30FPS or 60FPS. So while selecting your resolution for your gaming monitor, make sure you keep an eye on the GPU power your gaming rig is able to provide. Similarly to the resolution, the refresh rate is depended on the GPU power of your gaming ring so make sure your graphics card is able to support your games at that rate. The most affordable is the Twisted Nematic (TN) panels which are popular among the gamers due to its fast pixel response and refresh rate but suffers from color shifting when looking from an angle. VA (Vertical Alignment) though provides vibrant colors, high native contrast, and deep blacks but they suffer from ghosting effects affecting your gaming experience. The third type, IPS (In-Plane Switching) is the best among them in terms of color quality, gray-scale performance, and wide viewing angles but fails to match with the level of pixel response provided by the TN panels. Gaming monitors should have a fast pixel response time that is measured in milliseconds (ms). The most popularly used pixel response spec is gray to gray which represents time a single pixel takes to transit from black or white or from one shade of gray to another. In gaming, the lower the response time, the smoother will be the camera movements’ giving a smoother overall picture compared to high response time which may result in motion blur since the pixels are not getting enough time to switch. Another issue is ghosting which is seen very rarely. Twisted Nematic (TN) comes with support for 1ms response time while IPS (In-Plane Switching) can be low as 4ms. So if you care about the smoothness and overall gaming experience, you should definitely consider this parameter. But the thing is you will hardly notice the difference between the 4ms and 1ms unless you compare them side by side. Without Adaptive Sync technology game screens will tend to lag or tear. The refresh rate is fixed at 60Hz for regular monitors meaning the display will refresh the 1/60th of a second. But the catch is the frames per second (FPS) presented by the graphics card is not constant and fluctuates up and down. So there is a need to sync between the two and this is where this technology kicks in. But the reality is most of the monitors are still at 60Hz while the performance of the graphics cards is increasing per year making it more difficult for the monitors to avoid misalignment and tearing issues. So, you need to check whether your selected monitors have support for the type of Synchronization technology provided by your graphics card. DisplayPort 1.4: Introduced in 2006 by Video Electronics Standards Association (VESA), it is not as widely available or adopted as the HDMI though it has similar capabilities allowing transmitting up to 32Gbps bandwidth allowing a higher resolution of 8K at 60Hz with 10-bit color or 4K at 120Hz. Furthermore, it comes with support for multi-stream transport technology, allowing independent display per port. HDMI 1.4/2.0: HDMI (High Definition Multimedia Interface) on the other hand I the most widely adopted in electronic products. HDMI 2.1 was recently introduced bit 2.0 is considered standard video interface widely used for 4k (3820 x 2160) content. HDMI 2.0 provides 18Gbps which is less than provided by DisplayPort 1.4. Mostly television content will be streamed at 24fps but the value will go up for the gaming content. 5mm Audio Out– This is designed for the speakers or headphones directly to the monitor instead of searching ports on the front or back of your CPU case. Monitors also provide 3.5 mm audio jack along with several USB ports. Monitors may include more connectors but the above mentioned are the most important. Video/Audio compatibility should not be a problem because most graphics card nowadays comes with one or multiple DisplayPort or HMDI ports and sound support. These two parameters are available in many gaming monitors which are designed to reduce Ghosting. Ghosting is a blurry trail your moving objects leave in the screen which occurs due to uneven pixel transition. Overdrive reduces this effect by speeding up the process of pixel transition through higher voltages. Motion Blur reduction also known as Ultra Low Motion Blur (ULMB) enables motion resolution when there is too much activity on the screen. However, there are some disadvantages to these technologies. You can use either G-Sync or Free Sync with Overdrive or Motion Blue reduction at the same time. Overdrive can create inverse ghosting artifacts while motion blue reduction decreases overall brightness. So keep in mind these points before choosing gaming monitors with this tech. It’s not a technical parameter and you can completely ignore it. The curvature of the monitor is your personal preference and is designed in a manner in which your eyeball sees. Also, it may not look good if you are planning it to stick on a wall. You can’t go buy any gaming monitor you like in the market. You have to consider the price and balance it with the other components in your gaming rig. The above-mentioned features like size, panel technology, synchronization technology all add up to determine the cost of a gaming monitor. Also, additional perks like stand will increase the cost. A 24-inch monitor with TN technology with fast gray-to-gray pixel response will cost around $170 without the support for G-Sync or FreeSync. Increase the size to 27 inches with the addition of 3D, Synchronization technology it will costs around $300 while top-end monitors of 30 inches and UHD resolution will cost you around $2,400 to $3500. Additionally, to find a perfect gaming mouse for your gaming rig, take a look at this gaming mouse guide of the 10 Best Gaming Mouse to Buy in 2018. So, here is the guide to the list of factors to look for when choosing a monitor. Follow the points and you will end up with a gaming monitor that will give the best bang for the buck. Next articleWhat Marketing SEO Tactics Can Improve Your SERP in 2019?